Bond The Fruits Game - FunGames.com - Play fun free games. 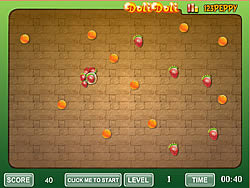 Move around the fruits on the screen to touch and select the one your mouse indicates. Use your skills to be sleek and move with delicacy and tenacity. be the master of this fruity fun game and prove you can resist any crowded challenge. oranges, apples, kiwis, strawberries and all sorts of yummy fruits will request for you to bond them together in specific bunches, so they can let you go to the next level and enjoy more and more fruits!